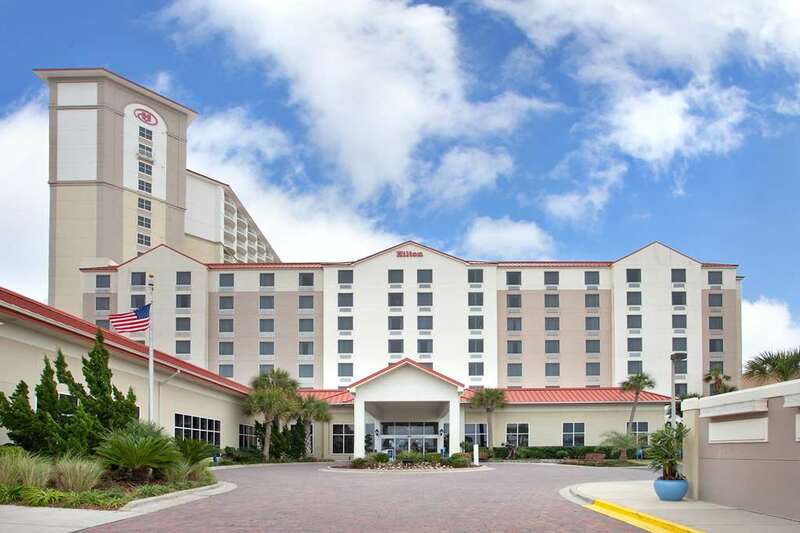 This hotel is 100 pct non-smoking The Hilton Pensacola Beach hotel is located in the heart of Pensacola Beach Florida and overlooks the Emerald waters of the Gulf of Mexico. Pensacola Regional Airport is less than 30-minutes away while water sports shopping and exciting nightlife are within walking distance. Deluxe accommodations friendly Pensacola Florida service and a relaxed atmosphere await our guests. At our hotel we thrive on pleasing leisure guests and business travelers. For our leisure travelers our guest rooms offer In-room hospitality center with microwave Refrigerator coffee maker On-command video TV video games Balcony Complimentary HBO USA Today each weekday morning. Especially for our business travelers the rooms also offer Wired Internet access available in all rooms - subject to charge Secure PrinterOn remote printing Two dual-line phones with voicemail and data ports Large work desk with desk level outlets and an ergonomic chair 30 000 sq ft of meeting space USA Today each weekday morning. In addition we are now featuring suite accommodations in our new 17-story tower. Choose from one-bedroom junior suites and two or three-bedroom deluxe suites with a full kitchen. All suites look directly over the Gulf of Mexico and feature private balconies. Come enjoy Florida hospitality at the Hilton Pensacola Beach Gulf Front Florida hotel. Travel should take you places. H2O A Cajun-Asian Grill: Casual dining. Enjoy freshly prepared American favorites at the only beach view restaurant on the island. The grill serves breakfast as well as a la carte lunch and dinner. Full bar service is available. Open daily 630am - 10pm. Butler*s Pantry: When you*re on the run we offer grab-and-go baked goods sandwiches and salads at our full-service coffee blended drink and espresso bar where we*re proud to brew Starbucks Coffee.